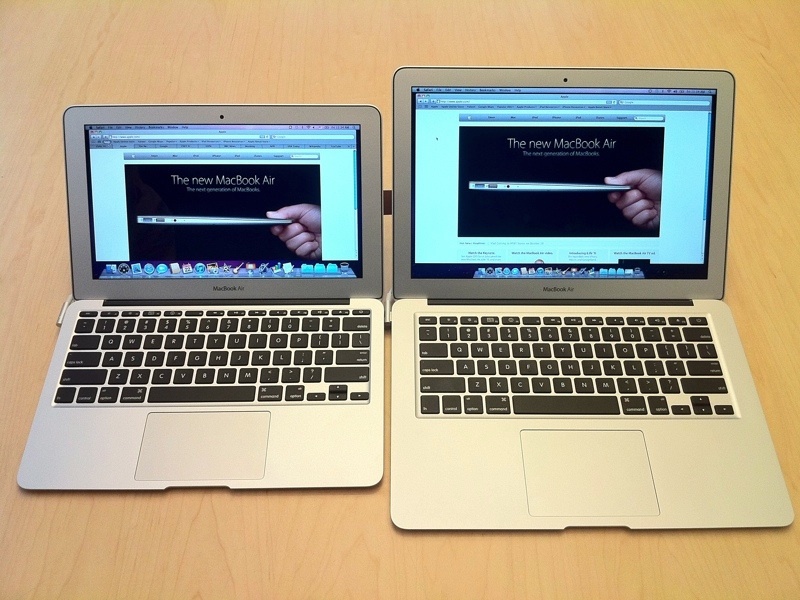 Is the Macbook Pro or Macbook Air a Better Choice? If you're looking to get a new Apple laptop chances are it's between these two choices, it must be because they're the only two laptops that Apple makes. They luckily leave a couple choices for you to make about how to customize your Apple Macbook. The Macbook Air has an 11 inch and a 13 inch model, you can also change the laptops hard drive size and memory if you need more room or a faster laptop. The Macbook Pro on the other hand has even more things that you can change! From the screen size to the difference Intel i5 or i7 processors they let you change a lot more on the Macbook Pro laptops because they're intended for much higher levels of computing. I'll cover some of the main differences between the two and let you decide with is best for you. The Macbook Air also dubbed the MBA ( Macbook Air for short) was first sold in 2008 and was Apples first attempt at such a small laptop and one of the first companies to sell a computer without a CD or DVD drive. It has taken off better than anyone would have imagined and is now one of the most popular and sought after laptops being sold. It has changed how lots of companies are making their laptops as well now trying to compete with the Macbook Air's incredbile battery life, 9 hours for the 11 inch and 13 hours for the 13 inch! No company has been able to get close and that is because the Apple Macbook Air uses some technology like no DVD drive, memory that is attached to the logic board for greater efficiency and solid state hard drives. It has made it one of the fastest, lightest and long lasting laptops around. If you're just looking for a laptop to carry to school, work or the park for basic internet and typing use this would be the model for you. The Apple Macbook Pro is almost exclusively offered with their Retina display now. The Retina Display is a very high resolution screen which sadly offers nothing for 99% of it's users. Unless you're doing very high end photo editing most programs can't actually take advantage of this screen resolution yet. Since it is becoming the standard for their Macbook Pros chances are you're going to get one with it. They are offered in two screen sizes just like the MBA, a 13 inch screen and a 15 inch screen with many different processor and ram options just like the MBA as well. The MBP (Macbook Pro) is meant for much harder tasks that require a lot of computing power like video editing, and other professional work. You can even buy them with an optional 1TB solid state hard drive now which is an insane amount of flash storage even for a desktop! The new lines of MBP can become very expensive but for this price you're getting one of the most powerful laptops ever built! However you can get their entry level models for around the same price as the MBA, if you want a larger screen, DVD drive and more computing power the Macbook Pro is the choice for you. However there are a few "downsides" such as a much shorter battery life (5-6 hours estimated) and a heaver computer which is still one of the lightest in it's class.